Sgt. 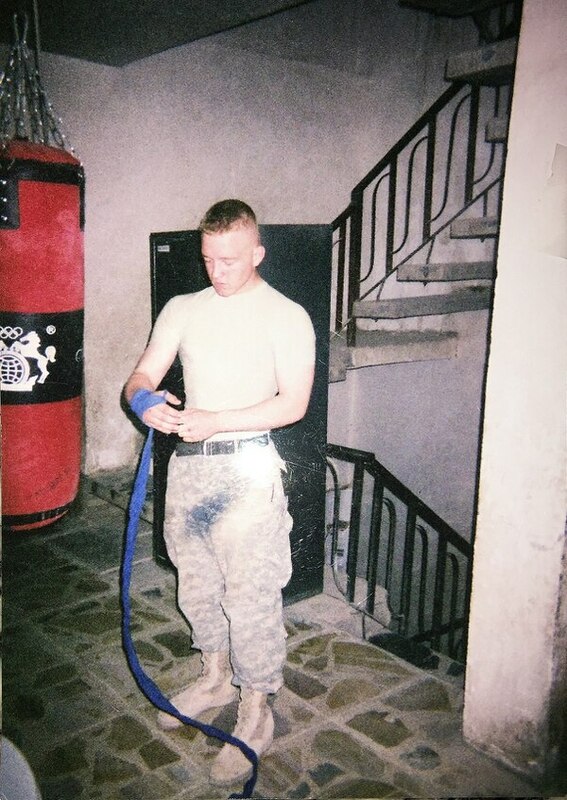 1st Class Colton Smith spent much of his free time during a 2007 deployment to Iraq watching DVD reruns of “The Ultimate Fighter,” hitting an old punching bag that he purchased at the local market in downtown Baghdad, and wrestling fellow soldiers in the front yard of their house in Ghazaliya. “Outside of working out … during our free time, there wasn’t a whole lot to do but just dwell on what happened that day, or the atrocities we’d seen in the war,” Smith said about deploying during the surge of troops into Iraq. Fight training was therapeutic for Smith; an outlet to channel his energy and emotions, but that therapy quickly became a goal that has grown into an ambitious dream. Ten years later, Smith’s fighting career has evolved far beyond an old punching bag hanging in a stairwell. On Saturday, he will face Sean Brady in a Shogun Fights bout for the welterweight title belt at the Seminole Hard Rock Hotel and Casino in Hollywood, Florida. Brady, 11-0, will be a tough opponent for Smith, who’s 7-4 in his professional career, but retired Sgt. 1st Class Jeremie Oliver, his head cornerman, isn’t concerned. Smith was thrown into his first fight just seven days after returning to the U.S. in 2008, and won. From that point on, whenever he was off duty, he was training for his next fight, culminating in his participation in season 16 of “The Ultimate Fighter: Team Carwin vs. Team Nelson” in 2012. Although a self-described underdog in the four-round, 32-person televised competition, Smith walked away as the season champion. Despite his success in the cage, Smith has continued pursuing his Army career. He put his fighting dreams on hold in 2016 to deploy for a second time, this time to Afghanistan for nine months. But the jobs complement each other, rather than interfere, according to Smith. “They go hand in hand. Having these skills … to either de-escalate the situation or escalate the situation accordingly are very similar to our jobs in combat,” said Smith, who is now the operations noncommissioned officer for Command Sgt. Maj. John Troxell, the senior enlisted adviser to the Chairman of the Joint Chiefs of Staff. His Army uniform also helps him keep in check any pre-fight anxiety. “What we do in the cage, … that’s easy. Bottom line, that’s easy. 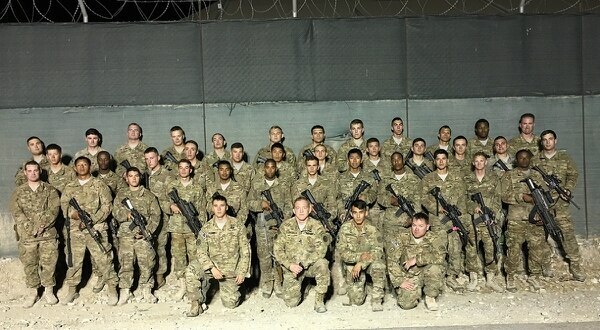 What the men and women do overseas, that’s hard,” said Smith, a comment that he admits has led to controversy in the past. While other professional fighters focus on training full-time, Smith uses his busy schedule, split between his fight training, his job at the Pentagon, and his role as a husband and a father to two sons, to help him stay balanced, strong, and healthy. He trains two or three times a day, six days a week. His first workout begins at 5:30 a.m., he hits the gym again during his lunch hour, and he can often be found training in the evenings in the cage in his garage. His diet is just as regimented. Smith begins cutting out soda, alcohol, and fried and processed foods 10 weeks before a fight. 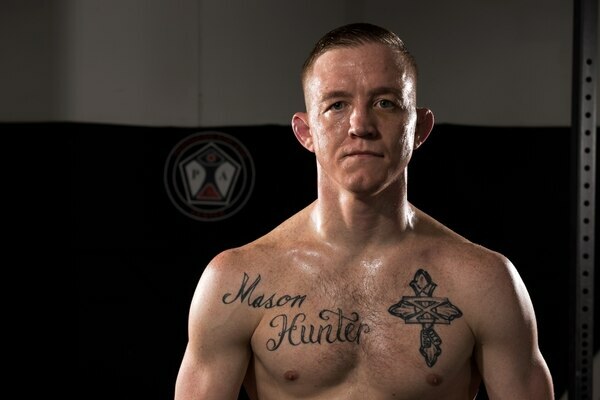 During fight camp — the six to eight weeks before a fight when he is training and preparing — his go-to foods are chicken, basmati rice, kefir, fruit, and chia seeds. And lots and lots of water. “After the fight I go for about a week eating all the foods I’ve been dreaming about,” said Smith. His number one junk food: pizza. But for now, Smith’s eyes are trained on a win on Saturday, and the future of his full-time professional soldier, part-time world-class fighter career. A livestream of Saturday’s fight can be found here.